Abstract: In times of international crisis social scientists should be able to position themselves vis-à-vis a world that has arguably come out of joint. Yet, particularly those engaging in theory all too often remain silent. A major goal of NIRT project is to counter this silence and encourage critical engagement with the world. Towards that end, the workshop addresses the interplay between practice-approaches and normative theory in International Relations Theory. Assuming the pitfalls of global order to be visible ‘on the ground,’ the workshop focuses on crisis as a contradictory process during which the meaning of order becomes subject to contestation. 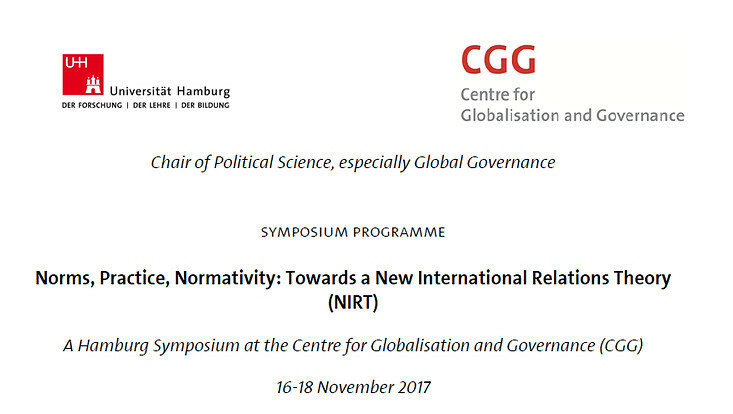 The underlying rationale of the NIRT project is thus to scrutinize the configuration of normativity in and through everyday practice.